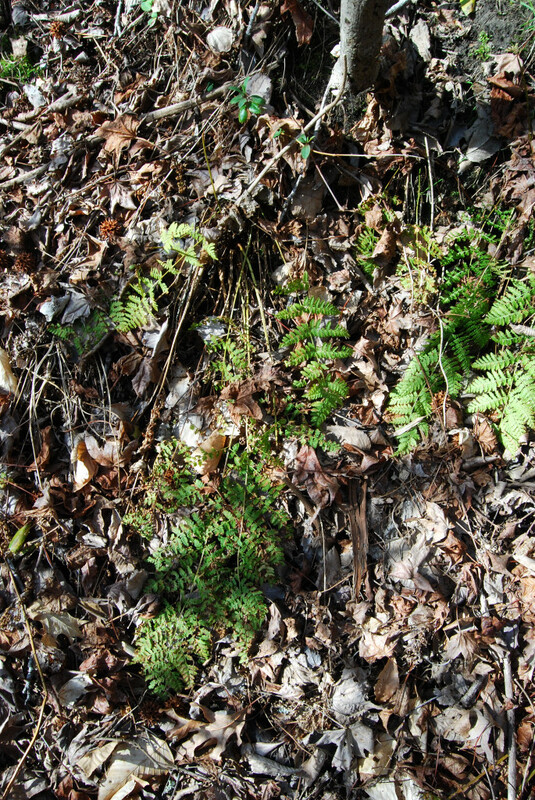 April 2019’s edition of the Plant of the Month is selected because it is one of New Jersey’s common ferns. The early April photo above is an example of the delicate yet evergreen fronds that overwinter each year. Lady Fern is found statewide, with the exception of the heart of the Pine Barrens (Hough, 1983; Montgomery and Fairbrothers, 1992). It grows in a variety of habitats, but prefers moist to seasonally saturated loams or rocky slopes under a deciduous canopy. The species is best represented in the northern counties, but the plants are also found on the southern Coastal Plain. Common lady fern has a variety of growth forms. Our plants are represented by two varieties: variety angustifolium (northern) and variety aspleniodes (southern; Montgomery and Fairbrothers, 1992). Lady fern is so named because of the delicate appearance of the unfurled frond, in contrast with more coarse Dryopteris filix-mas, male fern. The early fronds, called “fiddle heads” are collected today as a wild delicacy. Native Americans used the fern for a variety of medicinal and food uses. The roots were used for urinary problems. The roots were also roasted as food, and of course the early greens harvested (Moerman, 1998).